Discover all 20 finished designs in our exclusive Look Book! Learn an updated take on the vintage art of broomstick lace with easy-to-follow photo tutorials! Made using a super-huge needle (the "broomstick") and a crochet hook, this technique creates a very distinctive cluster lace stitch that's fun and fast to crochet. Donna Wolfe has been a "yarnie" for over thirty-five years. Her NaztaziaÂ® YouTube craft tutorial channel has grown to almost 200,000 subscribers. 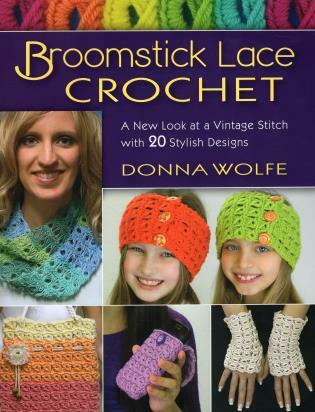 Donna's basic crochet video has over 6.5 million views, and her Broomstick Lace videos have more than 1.5 million views. Donna's website, naztazia.com, gets tens of thousands of unique visitors daily. She is a member of Crochet Guild of America (CGOA) and The Knitting Guild Association (TKGA). When she's not working with yarn, she serves as a business consultant as well as an instructor of IT courses at local colleges and universities. She lives in Pennsylvania with her husband, David, two children Sarah and Shawn, and her puppy, Bella.